"If I had a voice in Meena's, I'd be a superstar by now!" 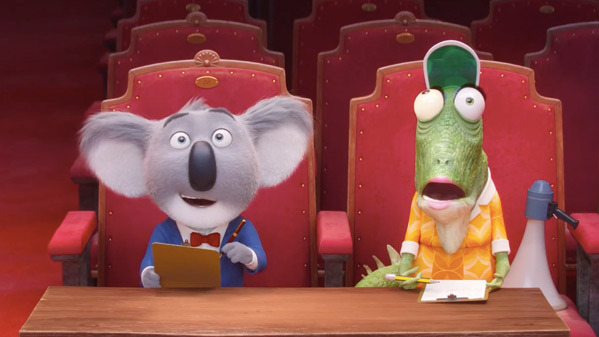 Universal has released a brand new extended 4-minute trailer for Illumination's latest animated movie titled Sing, a musical about a singing competition hosted by an ambitious Koala named Buster Moon, voiced by Matthew McConaughey. This trailer has much of the same footage from the first trailer, but spends more time introducing the various characters who make it into the competition. Many of them are misfits and the movie seems to play up the idea that some of the best musicians are hidden in society and must be given the chance to express themselves. It could be enjoyable, lots of songs used in it. The cast includes Reese Witherspoon, Seth MacFarlane, Scarlett Johansson, John C. Reilly, Taron Egerton, Tori Kelly. Arrives in theaters Christmas week. This movie is gonna be so cute. I can't wait for it. Autotune used correctly is magic.